A 36.8 metre Heesen motor yacht has been sold with Thom Conboy at Ocean Independence representing the buyer and seller, and has been named Man of Steel. With exterior styling and interior design by Omega Architects, Man of Steel was built in aluminum by Dutch yard Heesen and delivered in 2005 with a refit in 2013. Accommodation is for up to 10 guests in four cabins comprising a master suite, two doubles and a children’s room with four bunk beds. All cabins have entertainment centres, flatscreen television sets and en suite bathroom facilities while a further three cabins sleep six crewmembers. In the main saloon, the aft lounge to port has a curved couch with large pillows and there is an ottoman upholstered in navy blue cotton with a white trim. To starboard are two modern Poltrona Frau chairs in chrome and white leather while the curved ceiling in suede leather accentuates the curved glass windows. An entertainment centre housing a 46 inch Samsung television screen hinges out for easy viewing across the saloon. Forward, the dining table with high backed Poltrona Frau leather chairs seats eight guests comfortably and there is port and starboard storage for glassware, china and cutlery. On deck, the flybridge offers two large seating areas, a dinner table seating 10 for dining under the stars, a six-seater bar and icemaker plus a Jacuzzi spa tub surrounded by sun pads. 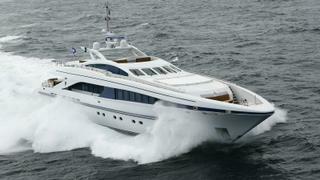 Twin 3,650hp MTU diesel engines power her to a cruising speed of 26 knots, topping out at 31 knots. Man of Steel was asking €10,900,000.